If you are not satisfied with the quality of your tap water and are looking for a healthier water solution for your home, you basically have two options: either use a water filtering system which comes in many forms, or use bottled water. This article targets those of you who have decided to go for the bottled water solution and are looking for the best and most optimal way to do it. Small water bottles (1 gallon or less) do not represent the best solution. Unless you stack a number of small bottles, you may find yourself at times running out of water. And if you buy many small bottles, you might face a storage problem. Also, to keep the water cool, you will need to allocate precious fridge space to your bottles. Finally, small bottles often are not refilled, and if not recycled, may create a lot of plastic pollution for the environment. The best way to implement a bottled water solution is using a water cooler (referred to also as water dispenser). These units can accommodate large bottles (3 to 5 gallons), they let you know when the bottle is empty or near empty so you can replace it with a full one, they can produce cold water (so you don't have to use precious fridge space) and hot water whenever you need it, and the large bottles are often refilled and always recycled, so they don't represent a pollution source for the environment. Bottleless Water Coolers have the advantage of not requiring to buy any water bottles and can therefore save you money in the long run. But these units need to be attached to the water supply of your home which may require complicated installations not at the finger tips of everyone, and once they are installed they can not be easily moved around. Furthermore, leakage and water damage risk exists when installation is not properly done or due to wear & tear associated with extended use. Finally, as tap water may still contain various impurities and bad taste due to the chlorine and other chemicals used in municipal water treatment, these water coolers may require the installation of a filtering unit as well as regular replacement of filters which may be costly in the long run. Bottleless water coolers are best for office and work environments. Top-Load Water Coolers do not require any installations or additional filtering equipment since most bottled water is healthy to drink and tastes good. But these units present a problem of a completely different nature: One needs to be almost a juggler to place the heavy water bottle on the cooler. You would first need to lift the full 5 or 10 gallon water bottle to an upside-down position right above the cooler and lower it (or drop it) gently into the top of the cooler. This is indeed a juggling act, because you have to be gentle while being quick to avoid spilling any water. Not always so easy to accomplish, specially if you are a small and not particularly strong person. Bottom-Load Water Coolers is the best option as it eliminates all the problems that come with the other two types. Placing the water bottle inside the cooler is a breeze, and no additional equipments or installations are required. You can move the water cooler around the house as you please, and as long as you select a good brand of bottled water, you are sure to drink always top grade healthy water. Also, as these large water bottles are nowadays recycled or refilled, there is no major impact on the environment. Given the above reasons, it makes sense to assume that the Bottom-Load Water Cooler is the one that will suit most homes and will be the preferred type by most people. There are quite a few water cooler manufacturers that sell bottom loaded units. Primo and Vitapur are among the best and the most popular among Amazon buyers. This article will describe and compare bottom-load water coolers Primo and Vitapur. 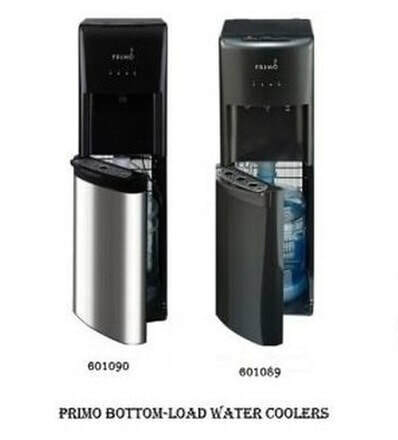 The most popular bottom-load water cooler models made by Primo are the 601089 and 60190. 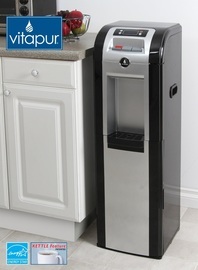 Vitapur has a single bottom-load water cooler, the VWD1006BLP-BL. First, the general characteristics of the Primo coolers will be compared with the characteristics of the Vitapur water cooler. This will be followed by a comparison of all Primo models among themselves to help you decide which model will suit best your needs in case you decide to get a Primo cooler. 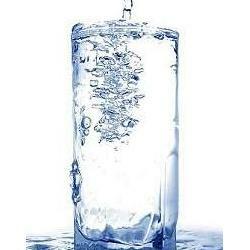 Note 1: The Vitapur cooler can produce water that is cold, hot and at room temperature. The hot water is obtained by pressing first the Kettle button which gets the hot water ready in under 3 minutes, and then pressing the hot water dispensing button which is child protected. This is an energy saving feature since the unit does not have to continuously reheat the water to have hot water available. Some Primo cooler models produce only cold and hot water, others can also produce water at room temperature. 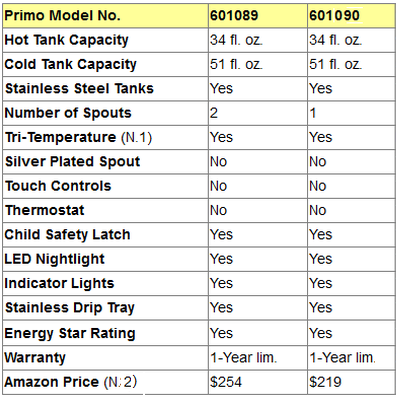 Please refer to the Primo coolers comparison table below to see model specifics. The Primo coolers do not have the energy saving Kettle feature found on the Vitapur cooler, but they are equipped with heating and cooling switches that can be turned off to save energy. Note 2: Both brands can accommodate 3 gallon or 5 gallon bottles. Note that these bottles are recyclable and refillable. If you are happy with the quality of your tap water, you can buy a bottle once, and then refill it with tap water each time it's empty. Otherwise, you can buy at your supermarket bottles that are already filled up with high quality potable water, or get them delivered to you. Note 3: The Vitapur cooler comes with a thermostat. Some Primo cooler models have thermostats, others don't. 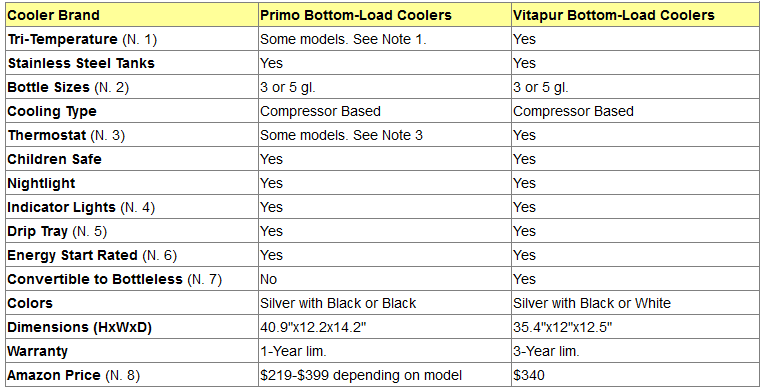 Please refer to the Primo coolers comparison table below to see model specifics. Note 5: The drip trays in both brands are removable and dishwasher washable. Note 6: Energy Star rating means that the units use 25%-30% less power than traditional water coolers.. Note 7: The Vitapur bottom-load cooler comes already equipped with what is needed to connect it to the tap water line of your home to convert it into a bottleless cooler. However, if filtering of the tap water is required, filtering equipment needs to be separately bought and installed. But, of course, the use of this feature is not required if you will be using water bottles. The Primo bottom-load cooler models are not convertible to bottleless coolers. Note 8: The prices shown are list prices and were in effect at the time this article was written and may have changed. Note that Amazon often includes an important discount to the list prices of sold products. For exact price information, please see the Amazon products section below. Note 1: Models 601089 and 601090 can produce cold and hot water as well as water at room temperature. Note 2: The prices shown are list prices and were in effect at the time this article was written and may have changed. Note that Amazon often includes an important discount to the list prices of sold products. For exact price information, please see the Amazon products section below. So which Water Cooler to buy? Primo or Vitapur? If you plan to switch to the bottleless mode in the future, then you should definitely get the Vitapur cooler, because it comes ready for conversion to bottleless mode (except for any filtering equipment you may want to add). The Primo coolers are not convertible. In terms of energy savings, the Kettle feature found on the Vitapur cooler makes it possible for the unit not to have to heat the water continuously. When you need hot water, you just press the Kettle button, and you have hot water in less than 3 minutes. This saves you energy. This feature is not available on the Primo units. On the Primo units you can save energy by turning off the hot water switch. As shown above, the two Primo models compared above have no thermostat, while the Vitapur comes with a thermostat. The warranty on the Vitapur is 3 years while it is 1 year on the Primo. This is another point to consider. Please click the following products for price information or to purchase.